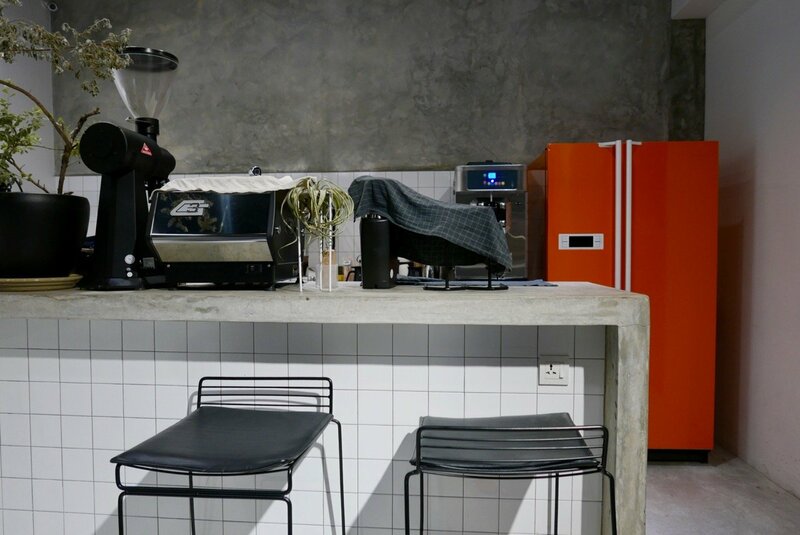 You may have visited Hold Up café in Penang during the day and thought that the big orange fridge they have behind the counter was responsible for keeping your milk chilled. Wrong! It’s actually a secret entrance to a hidden bar, Out of Nowhere or OON dubbed by regulars. I guess it’s the boozy version of The Chronicles of Narnia, with the wardrobe replaced by a refrigerator and the characters behind it substituted for liquid chefs. 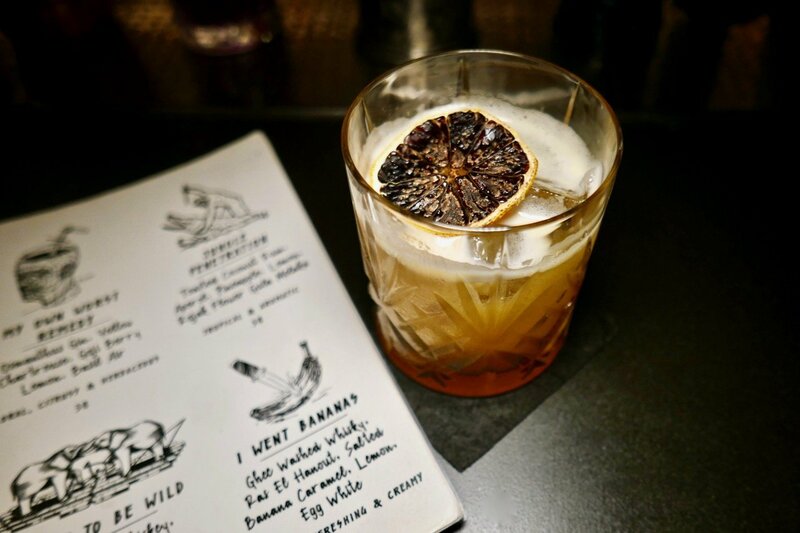 Whatever your fantasy, the team at Out of Nowhere aim to fill your night with mystery and intrigue through a range of fantastical creations vividly illustrated in a notebook menu. 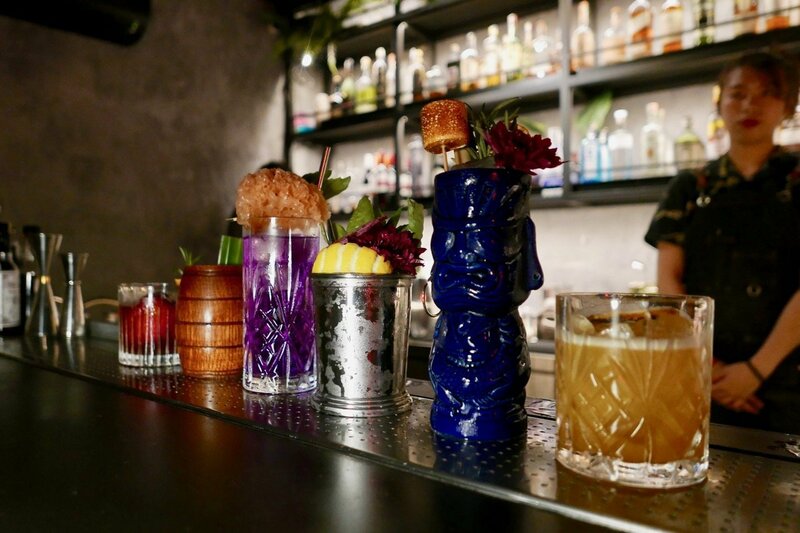 Each cocktail and its ingredients are illustrated with a drawing in black ink along with the flavour profile of the drink assisting with choices for individual palates. 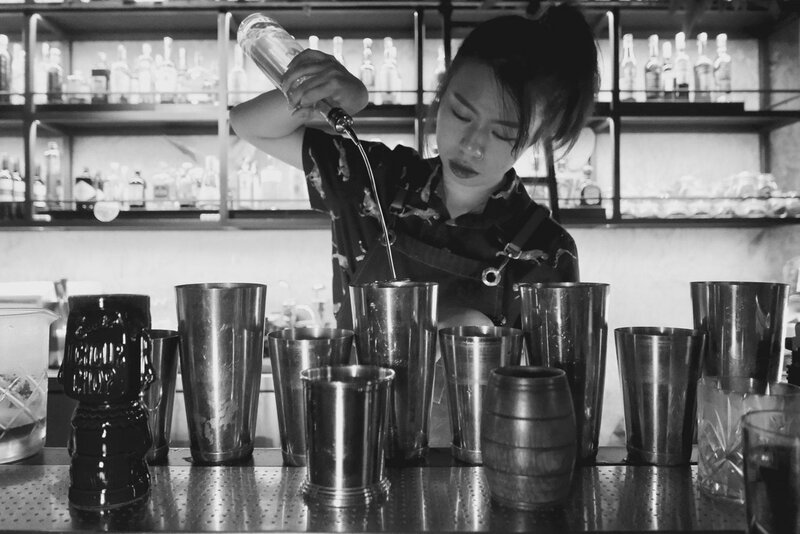 We’re ready to try across the spectrum and bartender on duty, Cleo, impresses with a show of shaking and stirring, masterfully whipping up all six that we order. Bringing warmth to our palates is the Thorn to be Wild (RM38). Red Bush Whiskey is combined with hawthorn berry, cinnamon and ginger to create a smoky, fruity beverage with a thread of warm spice. A frozen apple cleverly replaces a cube of ice keeping the drink cold (and providing a snack if you’re hungry). I am rather fond of the depth of flavours and round, smooth finish in this one. Marked on the menu by a dramatic doodle of a banana being stabbed by a hunting knife, I Went Bananas (RM38) is sour, refreshing and creamy all in one sip. Ghee- washed whisky, ras el hanout (a Moroccan spice mix), salted banana caramel, lemon and egg white is served in a rocks glass with a dried orange slice as garnish. Sweet Pea of Mine (RM38) has me humming the Guns ‘n’ Roses classic (unfortunately, I think the pea version is going to stick in my head, doomed to be forever derision). 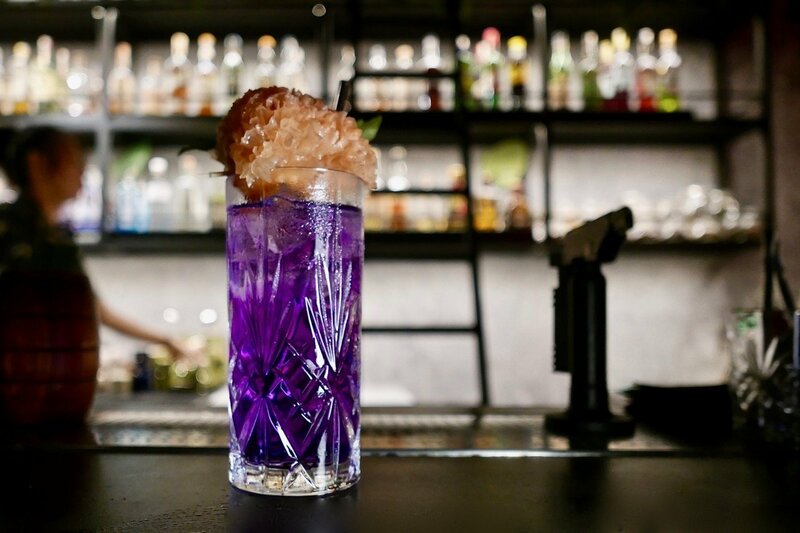 It offers a soft floral bouquet and cooling properties with water chestnut gin, citronella infused wine, pandan tonic and butterfly pea flower. A large wedge of snow fungus is a unique garnish along with Thai basil and orange peel. It’s a gorgeous purple due to the butterfly pea and has a distinctive bitter finish, reminding me a little of some Chinese medicines. Another thirst-quencher is found in the Cool Release (RM38). Cucumber gin, elderflower, basil, starfruit and lemon are topped with a garden of garnishes. The result is wonderful aromatics of blossoms and citrus that follow through from the nose to the palate. 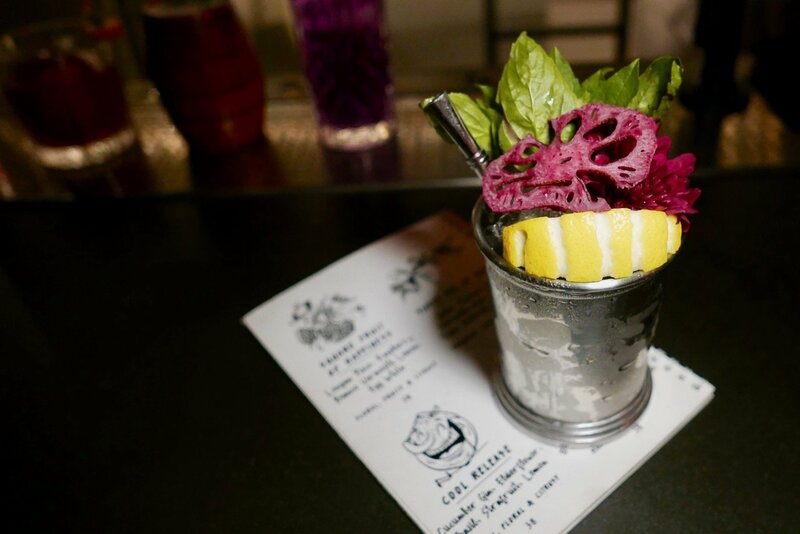 Back to the horticulture, the metal cup is blooming with dehydrated slices of lotus root coloured purple with beetroot, copious leaves of Thai basil and a wedge of lemon. It is both Instagrammable and very refreshing; hubby’s top pick. A sketch of a sinking boat with a sailor holding fast to a wooden barrel and the speech bubble, “I’ll never let go. 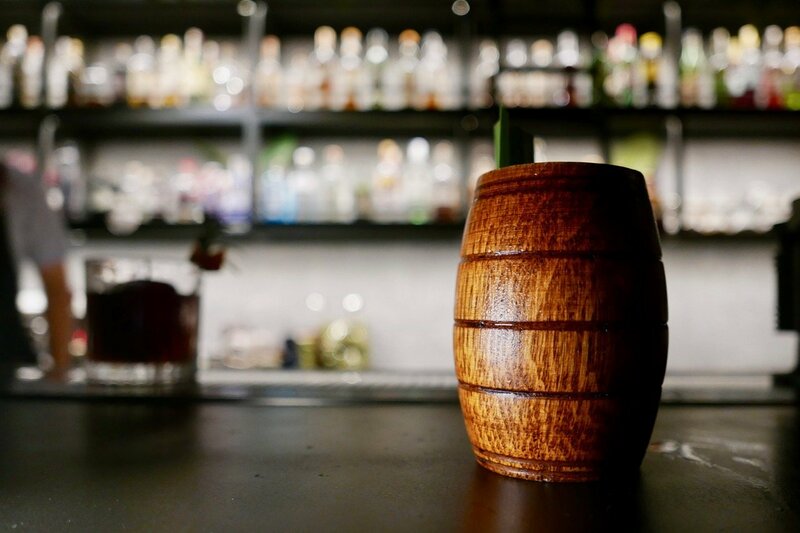 I promise,” introduces Jack in a Barrel (RM38) on the menu. Guaranteed to go down as easily as the sinking ship, this mix of jackfruit genever, Port wine, 5-spice agave, lemon and egg white is malty, fruity and tart. It’s well-suited to any mariner looking for a bit of depth in their drink. 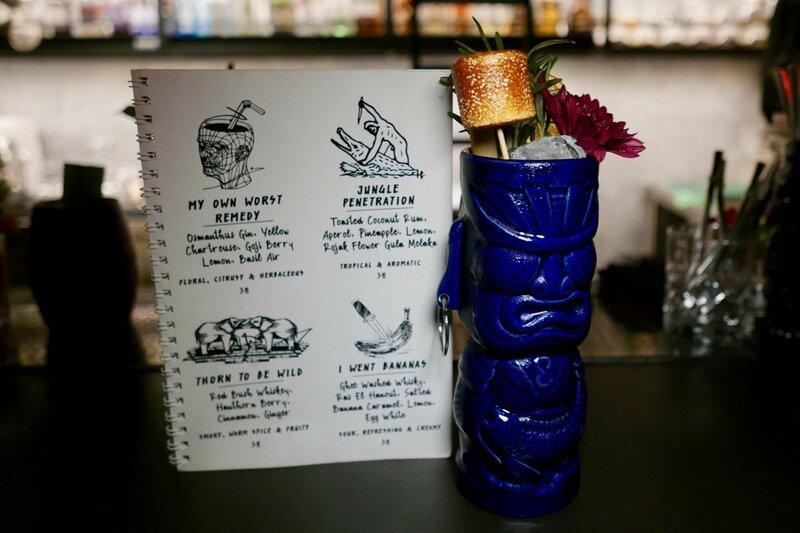 Lastly, the Jungle Penetration (RM38) on the menu provides another stark image of a naked native straddling a crocodile ready to take his prey with a theatrical swing of his blade. 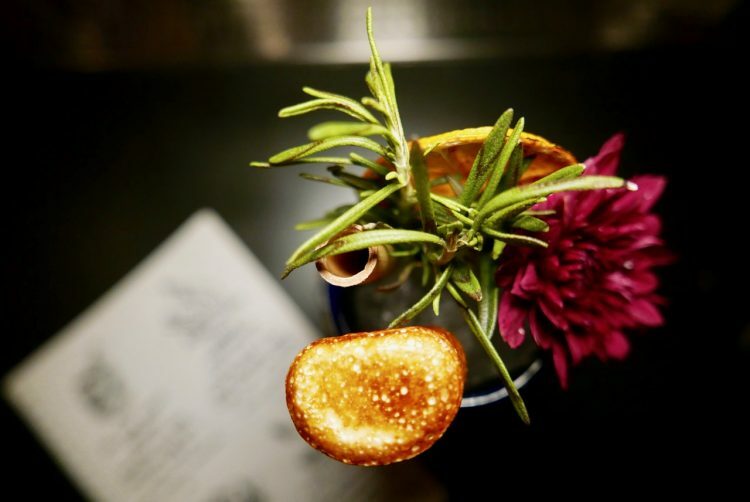 Served in tiki cup, this mix of toasted coconut rum, Aperol, pineapple, lemon, rojak flower and gula Melaka is finished with a toasted marshmallow, torched rosemary and a purple flower. 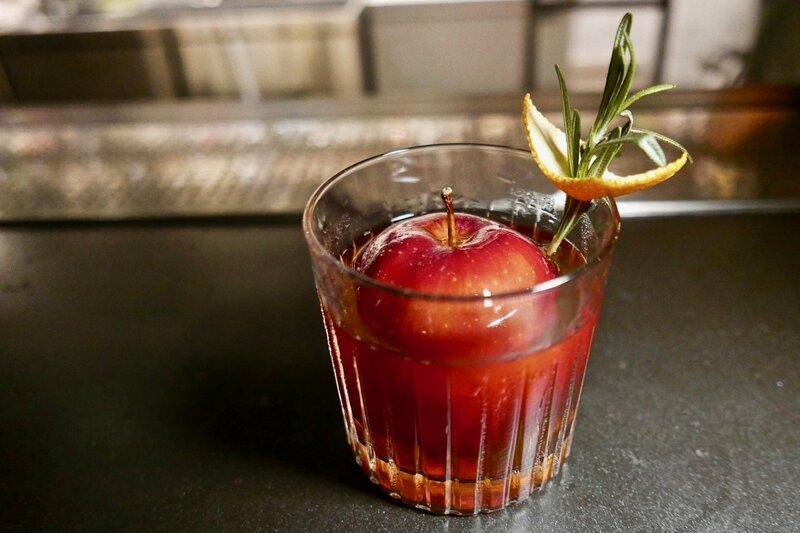 The aromas of the rosemary first hit the nose and then influence the clean flavours of the drink. Both tropical and aromatic, it’s another refreshment perfect for a hot day. 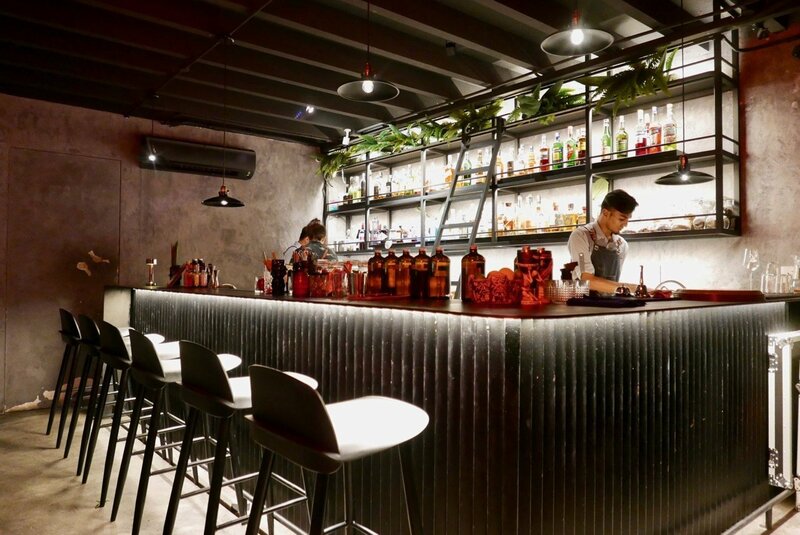 Find more on Penang’s vibrant culinary scene here. Very suitable name, Out of Nowhere 🙂 The cocktails are intriguing and quite inventive. It’s a pity that I don’t drink or else I would have one more thing to look forwards to besides food.